We don’t know about e-Commerce retailers, but it sure is a “hot season” for lemonade stand kids from your neighbourhood. Ironically, the blistering heat of the past few weeks have reminded us that “hot” is not just a fancy metaphor, but the reason your ice-cream melts faster than you give it a lick. With our dear readers in mind, we have prepared a remedy that will make your conditioners pointless - the coolest digest of top 10 e-Commerce articles of May. Ready to chill? 1. With all the hustle and bustle about mobile optimization, it seems like e-Commerce is confidently heading towards becoming primarily mobile indeed. It’s estimated that the mobile traffic share is going to increase rapidly in the next few years. But will sales skyrocket too? Yes, if you pay attention to How to Get More Sales From Your Mobile Visitors infographic on Quicksprout.com. 3. World’s most popular photo sharing social network - Instagram - possesses a tremendous potential for online merchants. However, due to its peculiarities, not all of the traditional marketing strategies work out equally good. To learn the latest Instagram sales strategies, read Profit From Your Visuals: How to Generate Sales from Instagram by Brian Honigman. 4. Is it possible to make a sale in 7 seconds? Yes, it is, but not the kind of sale you’ve thought about. The first “little” sale, according to Craig Elias, is to stimulate customer’s interest enough that they agree to spend some time learning more about your product. Afterwards, a big one comes about. Already interested? Read How to Win a Sale in 7 Seconds on for more info. 5. Unless you’re using an API-based shopping cart, you need to choose a hosting for your online store. This is one of the first things you need to consider and yet one of the most important. Julie Liu, the author of How to find the right hosting for your online store, makes clear on what 3 major types of hosting option are, their differences and features you should consider when choosing one. 7. Compared to photo, video is incomparably better when it comes to the need of demonstrating the product. Since customer expectations from e-Commerce are higher than ever, easy consumable and engaging video content is a powerful weapon in retailers’ hands. So why leave it underused? How to How to Use Video to Increase Conversions and Sales in Your Ecommerce Business article by Richard Lazazzera gives its vision on the issue. 8. While most of the marketing efforts are aimed at acquisition, businesses lose a significant amount of profits because of a high customer churn rate. What’s the remedy? Susannah Morris shares her thoughts and ideas on the topic in How to Leverage Content to Delight Your Customers and Increase Brand Loyalty article. When a solid customer community is built, all the rest will come on its own. 9. What is awesome about e-Commerce, is the fact that literally everyone can start selling their goods worldwide. On the other hand, such a lucky opportunity guarantees nothing, and quite little of merchants actually success in their global market expansions. An infographic The Ecommerce Eye Candy - Global Ecommerce by Elan Sherbill, explores the reasons of common failures, providing us with info on different markets’ opportunities and challenges. 10. How to increase conversion rate? Though this is a crucial question of a high interest and lots of answers, many merchants still suffer from low sales volume. Taras Kopchak, the author of 5 Tips on Magento Conversion Optimization article, suggests a few basic, practical yet efficient recommendations on the topic. Find out how store performance, toll-free telephone number and product reviews are related to the customer conversion rate increase. 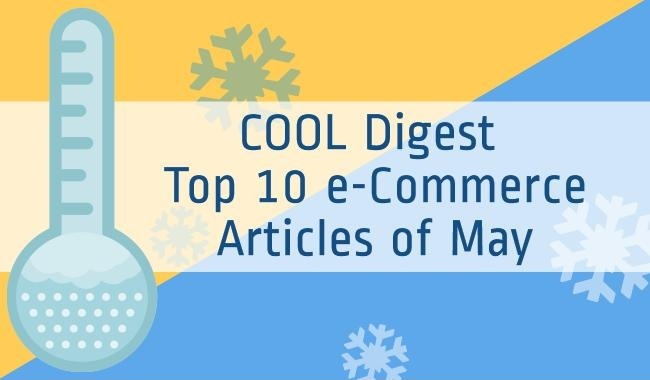 This was our very special “cool” digest of top 10 e-Commerce Articles of May. Have we missed any worthwhile writings of the previous month? You’re welcomed to share them in the comments below.